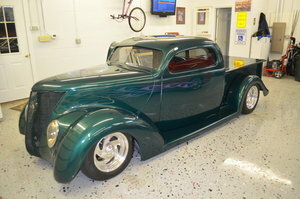 1938 Ford Pickup. Very nice truck! Exterior color is red. Interior is black and maroon. It has American Racing Mags, 14\' front 15\' rear. Good tires. 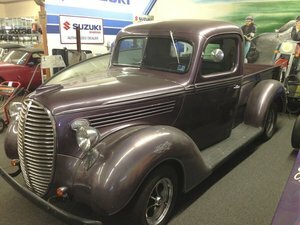 It has 350 Chevy engine, 350 GM Transmission, and 9\' Ford Rear End. It has pine wood and stainless in bed. Power Steering. It has a nice box in the bed that houses the Battery and electrical cut off switch. Has a new battery and starter. Please Note The Following **Vehicle Location is at our clients home and Not In Cadillac, Michigan. **We do have a showroom with about 25 cars that is by appointment only **Please Call First and talk to one of our reps at 231-468-2809 EXT 1 ** FREE Consignment Visit Our Site Today Easy To List Your Vehicle and Get it Sold in Record Time.